New England is one of the most romantic destinations you’ll ever encounter. From the elegant scenery to the historic charm, it’s an ideal region for couples to escape their regular routine and fall in love all over again. The town of Greenwich, CT, is the perfect place to start! Here, you and your sweetheart will discover the most romantic things to do in CT. Here are just a few of the best romantic day trips in CT that you absolutely must try together! Looking for more romantic things to do in CT? Our complimentary Greenwich Vacation Guide can help! This helpful resource has helped so many couples plan unforgettable New England getaways time and time again. For a complete list of hand-picked restaurant, event, and attraction recommendations, download a copy today! As regional experts, we are more than happy to help you and your sweetheart experience the area as a local would! There are plenty of towns near Greenwich, CT, but you don’t have to leave this historic place to experience classic New England romance. The best way to woo that special someone is to take a romantic day trip to CT! Here are some of our favorite ways to spend an intimate day around Greenwich. One of the most romantic things to do in CT is viewing the stunning Greenwich mansions that line the town’s backroads. Greenwich real estate is some of the best in New England, and the homes are absolutely breathtaking! Whether you are your sweetie are dream-building or looking for a new place to call home, you may want to consider a fun-filled bike trip along the Gold Coast of Connecticut. Who doesn’t love a little house hunting? If you’re in need of some alone time together, a private ride on a luxury yacht may be just what you need. Greenwich Boat Charters provides a variety of options including dinner and cocktail cruises, New York Harbor tours, leisure harbor cruises, and more! The lull of the waves and the stunning backdrop of a Greenwich sunset is the perfect setting for any romantic evening. Everyone knows that Greenwich, CT, is one of the best cities in the Northeast to visit. If this historic destination is already one of your favorites, why not take a day trip to one of the fantastic towns near Greenwich, CT, next time you visit? Here are just a few of the best New England towns perfect for a day of exploring. This is one of the largest cities in Connecticut. New Haven is the home of Yale University, which includes one of the best (free, yet sophisticated) art galleries in the country: The Yale University Art Gallery. There are also plenty of acclaimed restaurants here that constitute some of the best date nights in CT! New Haven is only an hour by train or car from Greenwich, so our romantic inn is within easy reach when you need to relax at the end of the day. On the other side of the state are the quaint and charming towns of Mystic and Stonington. Both of these seaside towns are former whaling hotspots. Both were beautifully restored and welcome thousands of visitors each year. There are plenty of things to do in both of these towns! Since Mystic and Stonington are small, a day trip from Greenwich is enough to soak it all in. Historic Stanton House Inn is a convenient choice for romantic weekend getaways in CT. Featuring 20 gorgeous guest rooms, our romantic inn is the perfect alternative to other hotels. We offer premium amenities, a concierge service, and a romantic setting you won’t find in typical accommodations! Some luxury suites we think will be perfect for your next romantic getaways in Greenwich are the Brush Suite or Sackett Suite. Don’t forget to add our Romance Package for an even more memorable experience! In our opinion, any time of year is a perfect time to plan a romantic getaway to Connecticut. If you’re thinking about taking a cool-weather trip to Connecticut with that special someone, be sure to check out our itinerary of romantic things to do in CT in winter! 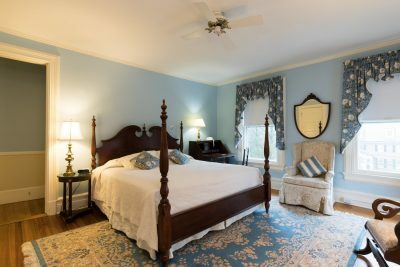 It’s packed with suggestions for fun date ideas perfect for those chilly days and nights in CT.
Book your romantic getaway to Stanton House Inn to start taking advantage of the fantastic day trips and hidden gems available in Connecticut!